I knit another top. Yes indeed. Knitting something takes approximately 1,000 times longer than sewing something, but I'm finding it strangely soothing as an activity. It's so portable. This is a pattern on Ravelry known as the "Grown-Up Tee", because it was originally published as a kid's pattern. There are only two other projects for the adult version of this pattern posted on Ravelry, which strikes me as strange since this is kind of cute, and not hard to knit. 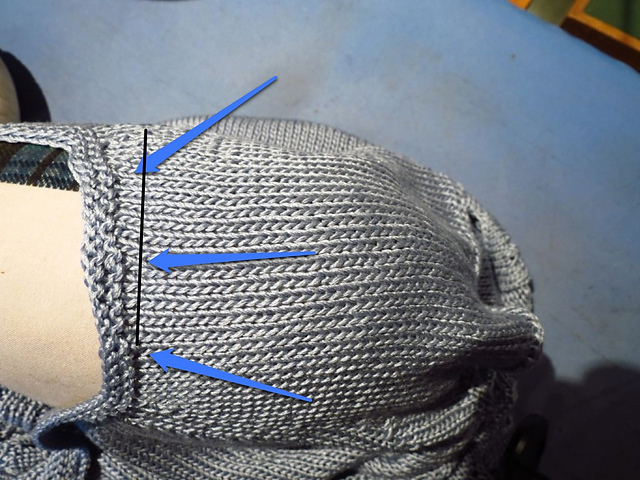 It is an interesting exercise to apply my sewing and fitting knowledge to knitting patterns. The pattern as designed is the same front and back, which would make for a very wide open and low-feeling back neck. I added some short rows which start along the top of the sleeve to add approximately 2.5cm (1") to the back neck. 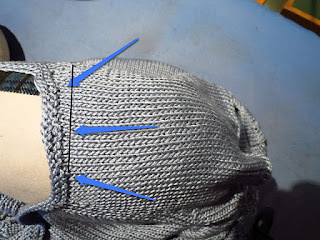 At left is a photo of the sleeve, taken from above, showing where the short rows start. The line is approximately where the neckline as designed would have fallen. I like to hang laundry on the line. Love that fresh air smell! The clothes pegs needed a new receptacle. The first one, built around a wire hanger, lasted 17 years I figure. It took about 30 minutes to make a new one. It has some design improvements which may make for additional longevity, like an extra couple of layers of canvas around the bottom of the hanger. Maybe it will last 20 years.